While trying to solve the riddle of a disease that causes rapid aging, Dr. Pulaski gets infected and has only a few hours to find a cure. It's good to see that the crew is still periodically evaluated for their performance, but when Troi says, "I've never seen a more dedicated physician," you have to wonder what she had against Dr. Crusher. I'm glad the writers didn't forget about remote access codes to Starfleet vessels. Why does Pulaski show up on the bridge? If it is important to have Sick Bay on stand-by, wouldn't it also be important to have the Chief Medical Officer there? Chief O'Brien is finally given a name. He also gets to be the guy who comes up with the idea that saves the day. Good job, Chief O'Brien! Troi has a very gentle way of calling people stubborn. 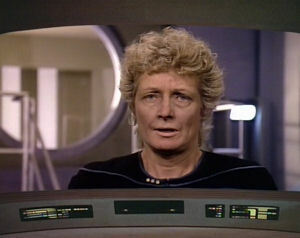 Pulaski does this thing where she shakes her head when she agrees to something, like when Data asks if he should set a course for Darwin station. It's pretty amazing that the transporter cures Pulaski of her disease and heals the damage it caused, but it's downright remarkable that it is able to keep her make-up completely intact during the transformation. All in all, a pretty good episode. It's a consistent character piece centered on Dr. Pulaski and Captain Picard, and it does a good job presenting a problem, conflict, and resolution. Isn't genetic research of the type being done on Darwin station extremely illegal by Federation law and interstellar law?